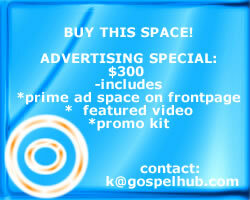 Gospelhub's Weblog | Gospel Hub. An educated and innovative Christian view.. Gospel Hub. An educated and innovative Christian view..
Let me introduce myself. It would be inappropiate to start yapping without a proper introdution. I’m Kenya D. McHenry. I was born and raised in Flint, MI. Currently I work at a small university as a Supervisor in Technology. I started gospelhub.com five years ago. It has went through several changes, and I have likewise. But, here I am still pulling, still pushing. I’m not hard to please, but hard to to counsel at times. I’m a self taught Internet guru. No formal training, just “pointing and clicking” untill it “clicked.” However over the past year I have had to make some choices. Choices about what really matters and what’s insignificant to me. You see although I had studied in London, Interned at The White House, and been offered positions with Microsoft, Ford, General Motors, and several other fortune 500 companies, I still didn’t believe in myself. Somewhere along the way I sought after ” things.” I deposited into everything and everyone except self.